Summer is my favorite time of year. Even though it is still spring and the weather hasn't yet reached muy caliente, I have been putting my grill to good use. Here are a few of my favorite items used when cooking on the open flame. Of course they can be used in any kitchen throughout the year, but the summer months put them into overdrive. Gelled Fire Starter: Great for my charcoal grill, and it doesn't add odor or flavor to food. I also use this on my outdoor fire pit when I grow impatient with the kindling. Black Truffle Sea Salt: Ah-Maze-ing. They probably need a 12 step program for this stuff. Rub a small amount on a nice filet and you can skip the marinade. Also great on grilled corn and veggies. Bamboo Skewers: Great for veggies, fruit or good ole fashioned s'mores. I also find use for them in the winter months when I am in the mood for a little fondue. Silicone Basting Brush: Forget bristles for basting. Those are incredibly hard to clean, especially if you are using oil or butter. With the silicone, you don't have to worry about losing bristles on your beef when the brush gets worn. It being dishwasher safe means more patio sitting and less utensil cleaning. Pizza Grilling Pan: My grill is like a brick oven, since it literally is made of bricks. So naturally it makes sense for me to own a pan used to cook pizzas on a grill. I love a good crispy crust, and this guy does the trick. Herb Mill: Fresh herbs make me happy, but chopping them can take forever. It really makes no prepping herbs when a better solution exists. Looking forward to making some honey marinated grilled peaches with fresh basil. Maybe I'll even add some fresh oregano the next time I have a pizza on the grilling pan. Um, can you tell I'm hungry? Pot Holder: This pot holder not only holds the pot, but holds your hand. Genius! 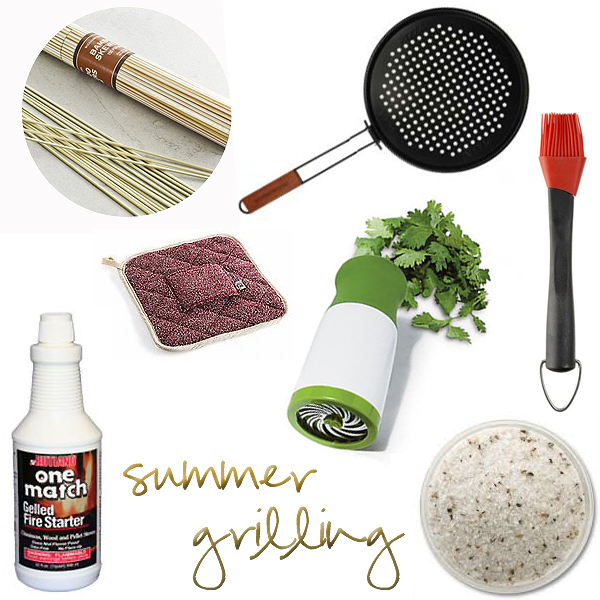 Does your summer involve lots of grilling or cook outs? What are your favorite products?